Boil chicken breasts in water until fully cooked. While chicken is cooking, mix all dry spices and salt in a medium bowl. When chicken is finished cooking, shred on a cutting board by pulling between two forks. Add shredded chicken, black beans and corn to bowl with seasoning and toss to coat evenly. 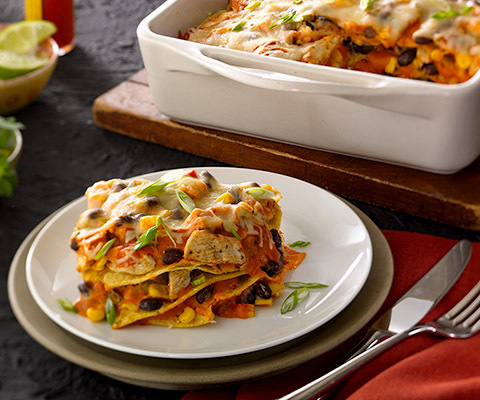 In a 9x13” baking dish, spread a thin layer of Classico® Spicy Tomato and Parmesan Cream Sauce. Place the soft tortillas oven the sauce to create the first layer of the lasagna. Top with about 1/3 of the chicken, bean & corn mixture. Sprinkle on top 1/3 of the scallions and 1/3 of the cheese. Cover with sauce, add another layer of tortillas and begin layering ingredients again. Repeat this for one more layer. You should have three layers ending with sauce on top. After 20 minutes, remove foil and sprinkle on remainder of cheese and bake for additional 10-15 minutes or until cheese is golden and sauce is bubbly. Top with remaining scallions and serve. If you do not like spicy foods, substitute with Classico® Four Cheese Tomato Cream Sauce. To make vegetarian lasagna, remove chicken and eliminate steps 3 & 4. Mix seasoning from step 3 into sauce.